I was going to post this originally as part of a bigger post all about how I made my recent Finding Dory collaboration cake, but Robin turned three years old recently and apparently has decided that clinging to me and whining all day is the hot new summer trend. So I’m massively behind in everything but really wanted to post about the ocean series from Marvelous Molds. I’m thus doing it now as a separate post while there’s still some summer left! Full disclaimer: Marvelous Molds is run by one of my cake friends, Chef Dominic Palazzolo, whom I consider to be one of the most ingenious innovators in the cake world as well as one of the most generous vendors and sponsors of multiple events I’ve been involved with. I definitely biased towards loving his moulds, but it’s well-deserved bias; I’ve purchased hundreds of dollars’ worth of moulds and onlays in the past because they are top-of-the-line in quality and useful for multiple applications. He sent me the ocean line for free for promotional purposes, but I was already a fan of his other work anyway. So there was a zero chance of me ever giving him thumbs-down on a product review because of all of that, but every bit of praise I give below is genuine because these moulds are super-detailed, easy to use, and made of high-quality, durable silicone. 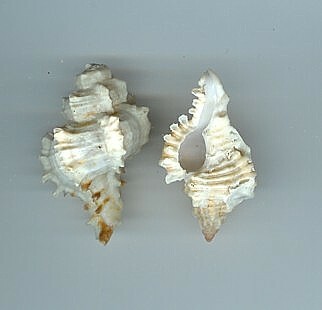 They even have the shell names printed along the outer edge so you don’t have to try to remember which kind is which. The only potential downsides I can think of are a couple of them are a bit tippy when filling with a liquid (I found I had to prop them on the side of a tray as I poured in my flexible chocolate mix), and they’re pricey. 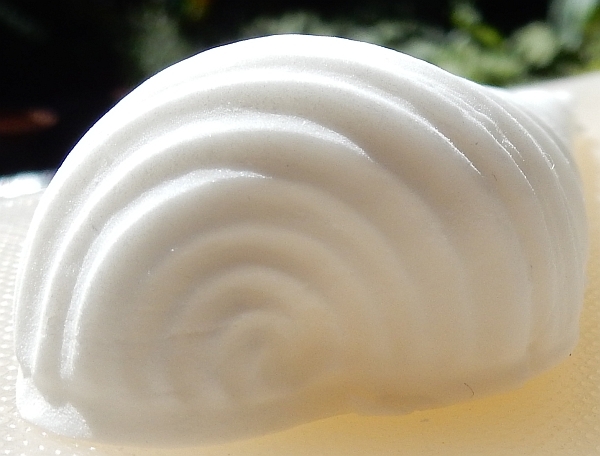 These aren’t your dollar-store cartoony shell moulds. If all you need is a one-off set of simple chocolates, then sure, the cheap moulds will work well enough. 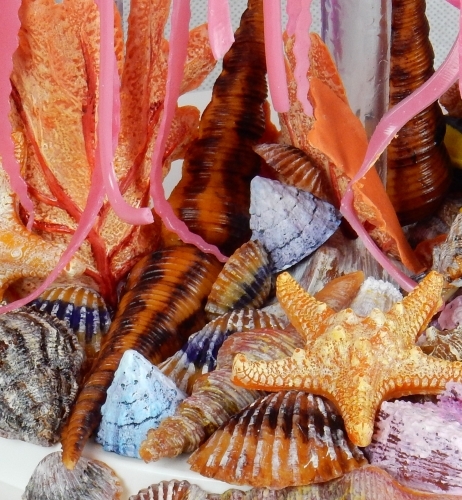 But if you’re a professional making detailed beach-themed wedding cakes all summer long, you will recoup the cost of these moulds easily in the speed at which you can produce realistic-looking shells. 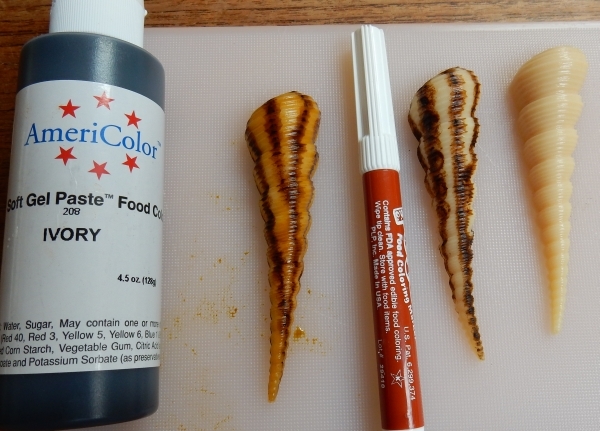 All that said, here’s my evaluation of the moulds using flexible chocolate, and some step-by-step photos of how I painted them. I didn’t use every mould in the set because the octopus and boat didn’t really fit the cake I was doing, but they’re all superb quality. I made up a standard white chocolate batch of the flexible chocolate (this white chocolate has a particularly beige tint to it), poured it in the moulds laid out on a baking tray, and then popped that in the fridge for a few minutes. 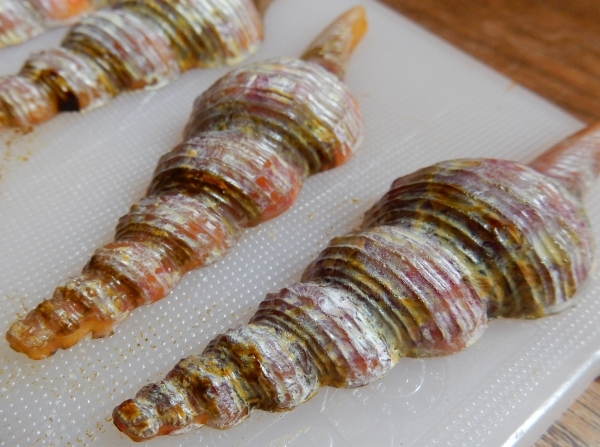 The shells came out beautifully with fantastic detail. This was so fast, I could easily generate enough to cover a many-tiered cake in a short amount of time. Of course colouring them takes a bit longer. 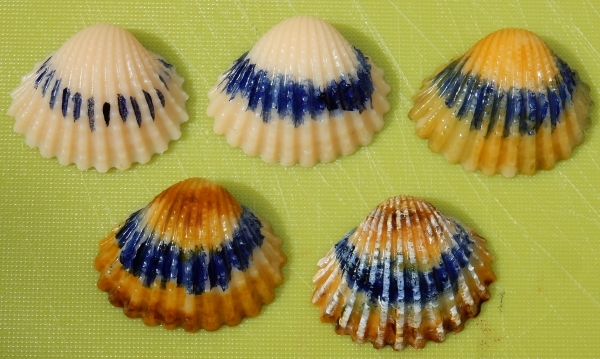 I Googled each shell to find real versions of it as colouring guides. 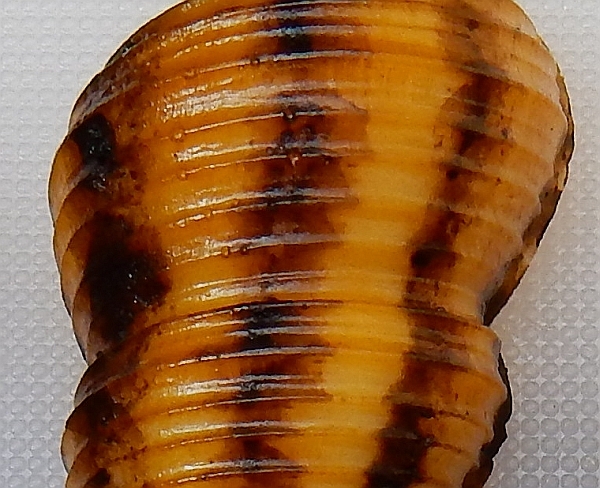 I started out by experimenting with dabbing edible ink markers roughly down the turret shell mould based on photos such as this one, going in vertical lines. Then I brushed some Americolor ivory gel over the whole thing, letting it collect thickly in some parts and brushing it thinner elsewhere. 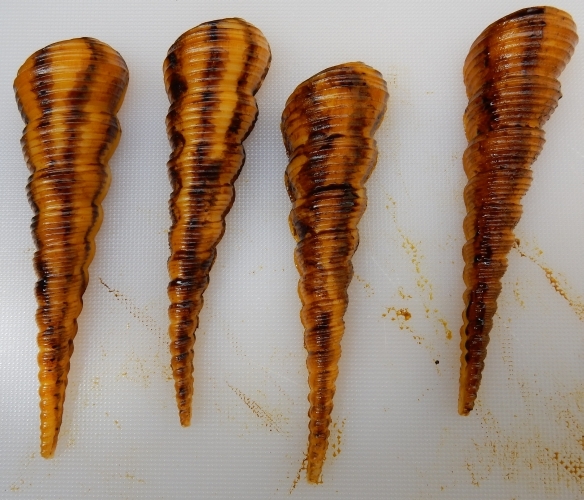 From right to left, an uncoloured shell, one that’s had the edible ink marker dabbed down it, and one that has been brushed with the ivory gel. 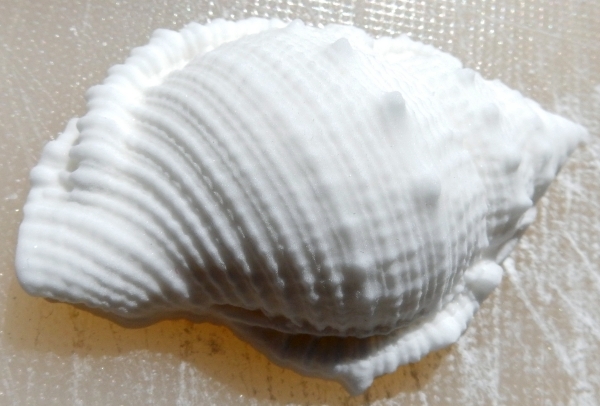 A gumpaste version of the same shell dabbed with the same marker. The speckling effect is interesting as well and could be brushed out with water or more colour, but I want to make it clear that the dabbing I’m doing with the markers is going to be very different depending on what media you use in the moulds. I made several, trying to vary the specifics of the lines but still follow the same general pattern, so they’d look like the same species but with natural variation. 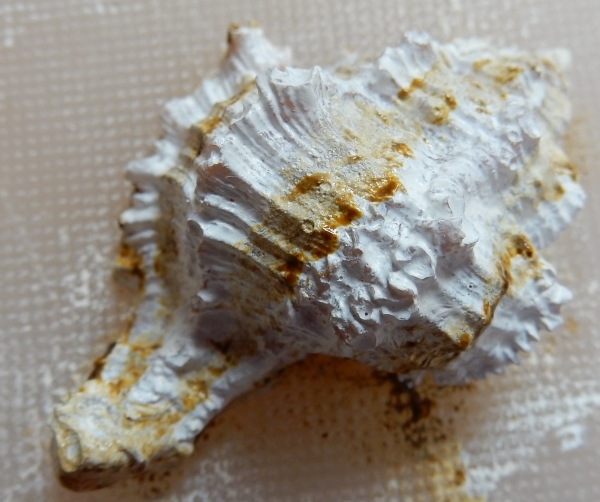 A close up to show the colour but also the fine details of the ridges produced by the mould. You won’t get that on a cheap dollar store mould! 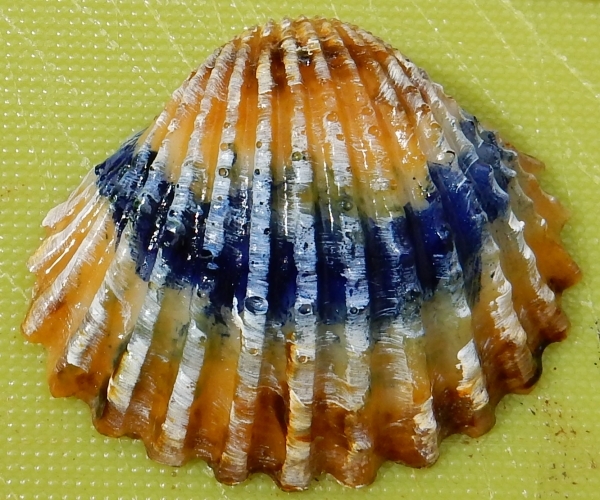 Next I looked up cockle shells (for which I have the small and large moulds) and really fell in love with the varieties that have blueish-purpleish lines, like these ones. The marker-dabbing was good for wide areas, but I wanted finer lines for these little ones so I instead used some Americolor royal blue. I painted that into the lines along a band, widened that out to the raised ridges, and then gave the whole thing a light wash of the ivory. Then I dabbed in thicker sections of ivory. 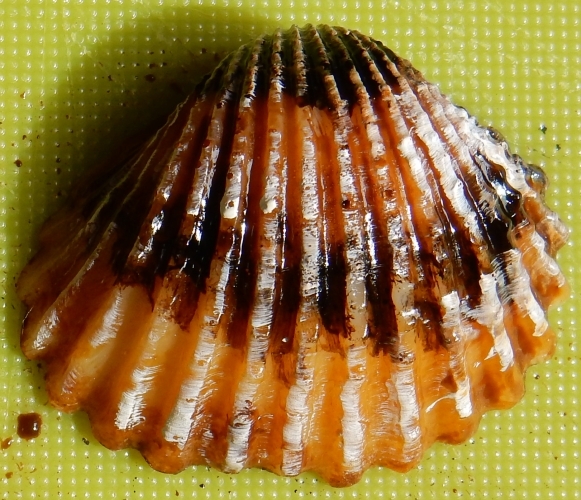 Stages of painting the small cockle shells. 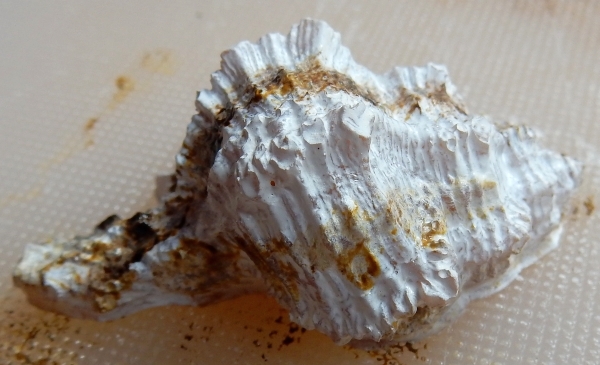 Once I decided that I really liked how the bright white looked, I started painting it as a more dominant colour on other shells. 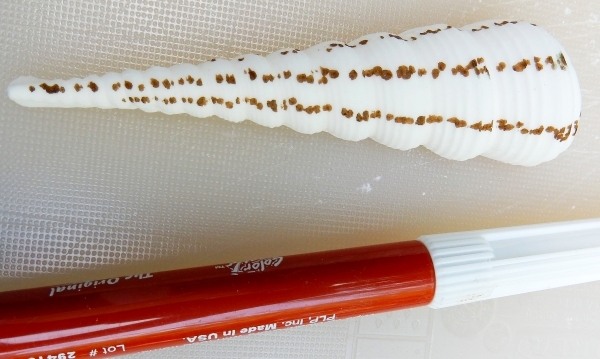 The lace murex shell is often very white with vertical lines, so for that one I lightly traced some ivory lines, then painted white over the whole thing in a way that blurred out those lines, and then lightly traced back over them with more ivory in a final highlight. 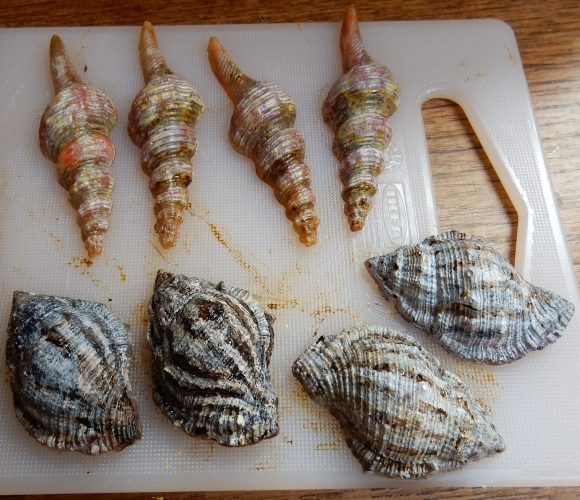 Next I painted some triton shells and spindles. Tritons come in many colours but I liked the ones here that had fairly even vertical lines (because that’s just easier to paint), and spindles come in so many varieties that I figured I could just make up what I wanted. So for the tritons I added some Americolor warm brown and a tiny dot of Americolor super black to my palette that still had ivory and white on it, so I could blend a gray-brown mixture. 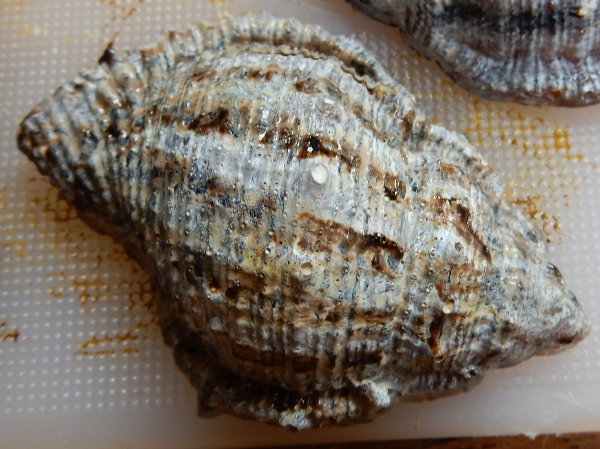 I coated the whole shell in that mixture and then added the darker lines on top, blending out edges in some place and leaving them sharp in others. For the spindles I wanted some colour variety in my overall shell bed, so I first dabbed with a red edible ink marker, and then used some watered-down white in a way that picked up a bit of the red and mixed it. Then I did a brush-tip white highlight over the whole thing. Obviously a lot of these colour choices are completely optional. 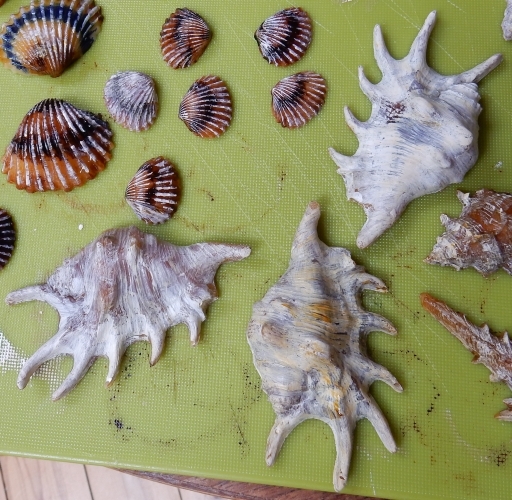 You can do as I did and look through Google images, or tailor your shells to a specified palette depending on your overall design needs. You do have to be a bit careful with the white, as it can get a bit gloppy and actually minimize some of the fantastic detail that comes from these moulds. 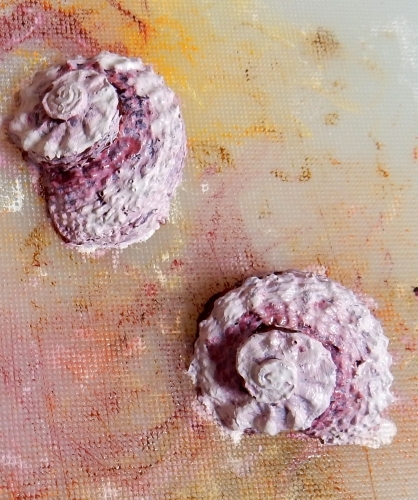 Likewise for the sugar snail shell, I wanted a brighter set so I went for some fantasy pink tones. I definitely went a bit overboard with the thick white on these, though, and that killed too much of the detail. 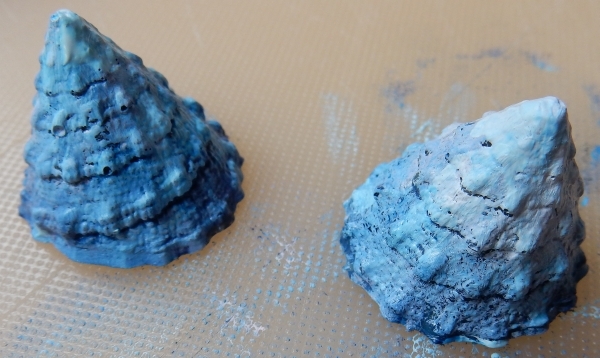 For the enormous lambis shells, I painted them first all over with the bright white, then played around with other colours I had left on my palette to make a variety of stripes and highlights. I made some darker and some brighter to give lots of natural variety. After all of this, I felt confident to have a go at the mould I was really excited about: the starfish. 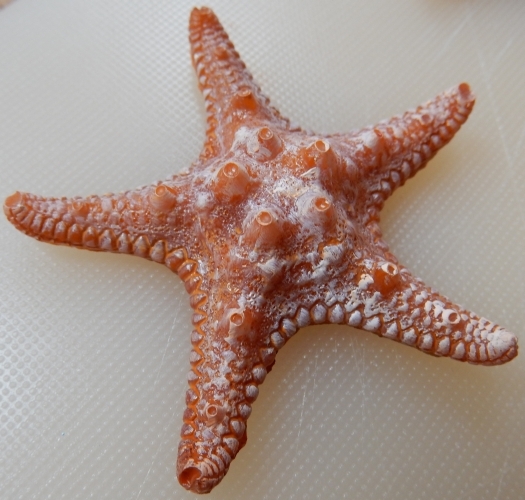 These moulds are so detailed, it looks like real starfish come out of them. My only complaint is there should be more sizes! The one they have now is a great medium size, but I’d love to see a small one and a larger one. 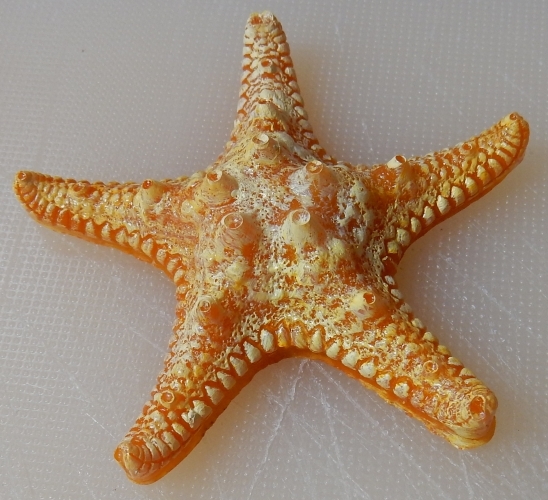 I painted one starfish with red and orange and the other with orange and yellow, all blended together to give very warm tones. Then I mixed a bit of the white with the base colour for each and did a brush-tip highlight sweep. I loved how they turned out. You can really see the amazing detail on them. 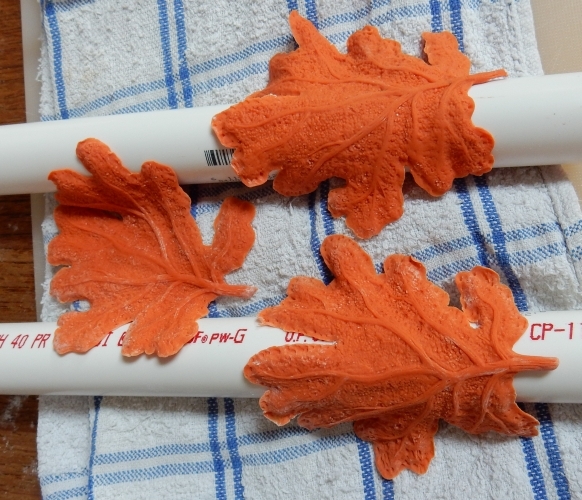 I also tried putting some fondant in the coral mould and drying it on pipes to give it motion. The mould worked really well but the fondant was not great; I should have used gumpaste instead. It rained the day I was assembling the cake and the humidity pretty much melted the fondant. Still, the coral mold itself was nice, although a two-sided one would be even better for situations where you don’t want it just pressed up against a cake. The single-sided one as it is would give quick, wide-area coverage to a cake. When those were fully dried, I gave them a light brushing with some yellow and white mixed together, and then darkened the main veins with some super red. Since the moulds are primarily designed for gumpaste, I do want to show you some quick white gumpaste versions I whipped up to illustrate the detail. Flexible chocolate is poured in so it doesn’t make use of one of the great features of all Marvelous Moulds, the cutting edge. That’s so you can roll your paste right into the mould and excess will easily be cut off for you. It’s a superb feature that you won’t find on cheap moulds. The moulds’ individual pages on the store website show you videos of this in action, and it really does work quite well, especially on shallow moulds. On deeper ones, they show you on the site how to best push material in to maximize detail and minimize distortion. End of the turret shell up at the top of this post from before I dabbed the marker dots on it. 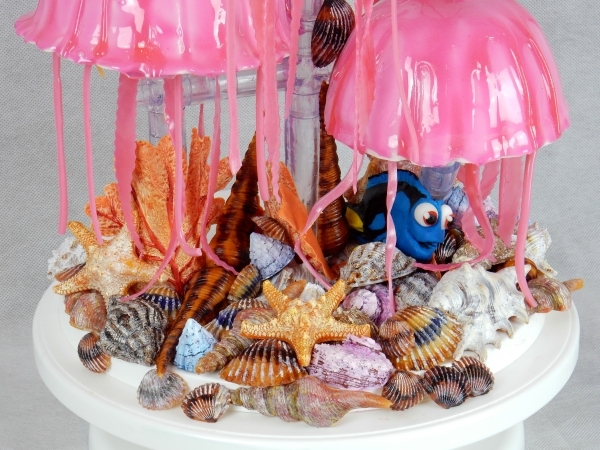 All in all I’d say if you need highly detailed, professional grade shell moulds, look to the Marvelous Moulds ocean line because they really are fantastic. I may be biased towards them, but it’s for good reason! This entry was posted in Cake Decorating, Experimental Techniques, Flexible Chocolate, Gummy, Products, Tool Reviews. Bookmark the permalink.